Our epileptic weather system isn’t just restricted to the UK. 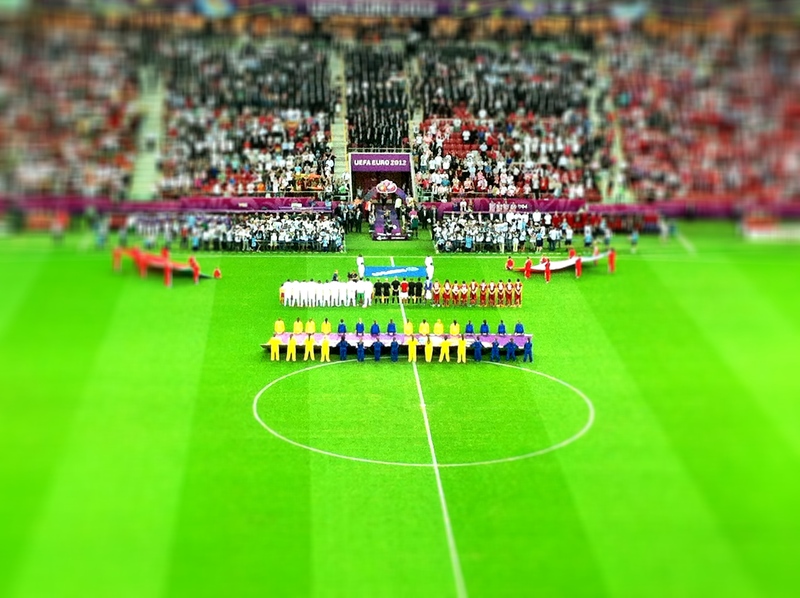 I took a bunch of journalists to watch the Czech Rep v Portugal UEFA Euro 2012 game and it was super muggy in Warsaw too. Unfortunately, the ever-changing climate we are experiencing in Europe has turned summer topsy-turvy. I know people already associate the UK with rain and bad weather but what we are going through this summer really is bordering on the ridiculous. Parts of the country are flooded again while in the South-east where I live, a hose pipe ban still remains in place. The constantly changing combination of rain and cloud, with sunny spells in generally still warm air temperatures, means we wander around in uncomfortably muggy weather still feeling chilly and cold throughout the day. I remember a friend from Singapore commenting to me that ever since I moved to the UK, I seem to talk (and moan) endlessly about the weather all the time. Easy for them to say that when the weather back home is pretty much constant, at least temperature wise. Here, weather news and reports are rendered practically useless when it can change from hour to hour, and vary from one neighbouring county to the next. This makes it invariably difficult to decide what one feels like eating. BBQs are simply out of the question because you don’t know if the sun will hold out long enough for you to even cook anything, yet casseroles and stews are at times just too warm because the thermostat still measures between 19 to 22 degrees. So last weekend, I tried to create something that represented a bit of all of the seasons we seem to be experiencing simultaneously– grilled pork chops more suited to sunnier climes, eaten with a casserole-style bean stew cooked in cider to provide the gentler warmth we still need to get through the cooler parts of our day and night. 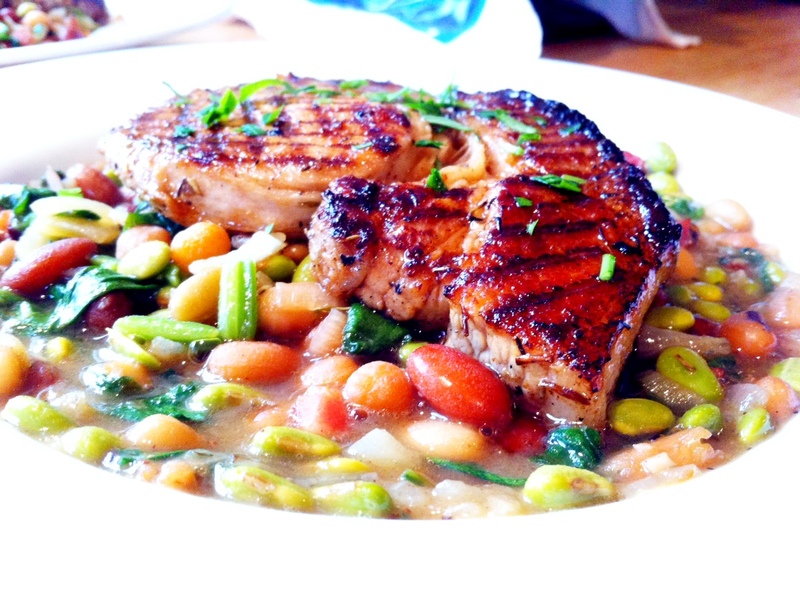 My summery take on a classic pork and beans recipe. 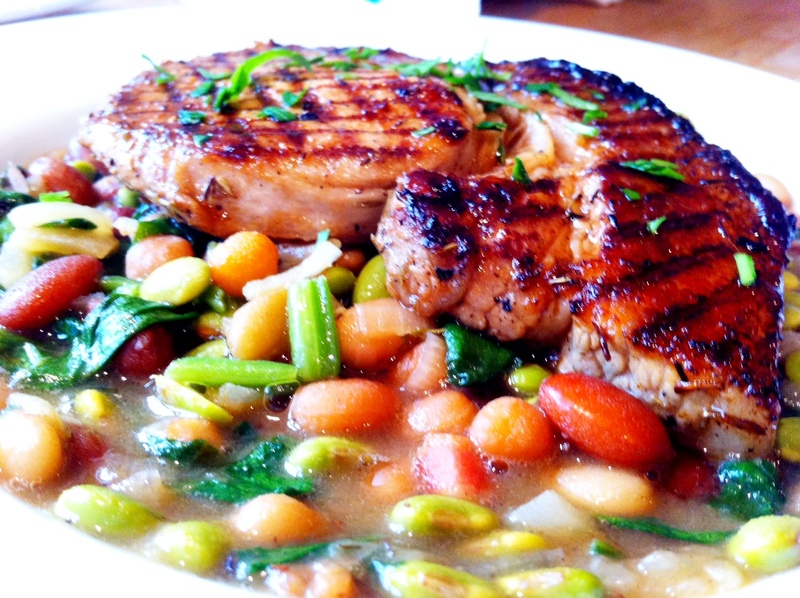 Grilled lemon & thyme pork chops with a bean stew cooked with cider. 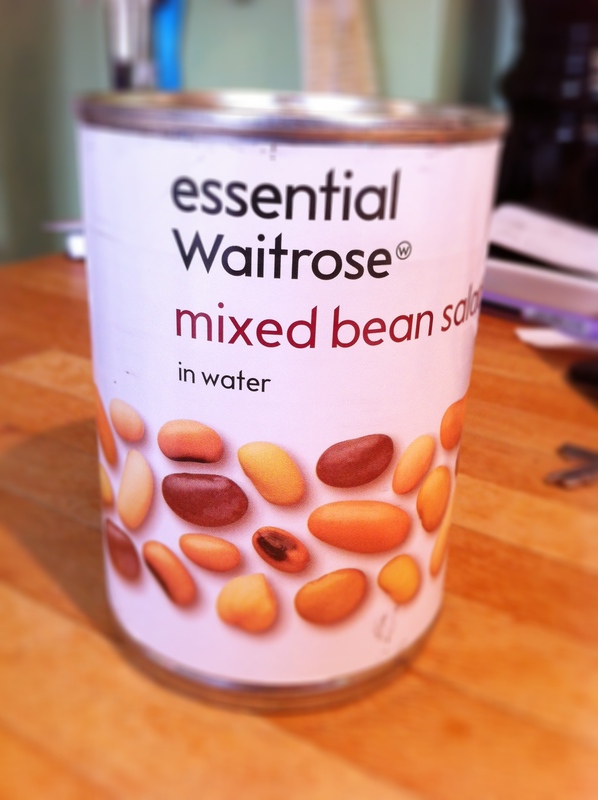 If you’re pressed for time, use tinned beans in water. They’re just as good. Speed and simplicity are also what I have focused on, and I’ve cut out a lot of cooking time by simply using a tin of pre-cooked beans (in water), which means apart from the time required for marinating the meat, it actually took only about 20 minutes to prepare this meal. I don’t often grill pork chops because it’s hard to gauge when you overcook and dry them out but this marinade is great for tenderising the meat, which meant I only needed a couple of minutes grilling on each side to keep these chops succulent, juicy and full of flavour. However, don’t let the picture of the grilled pork chops fool you – today’s star of the dish is undoubtedly the casserole-style bean stew, though stew is misleading because these only took 10 minutes to cook. 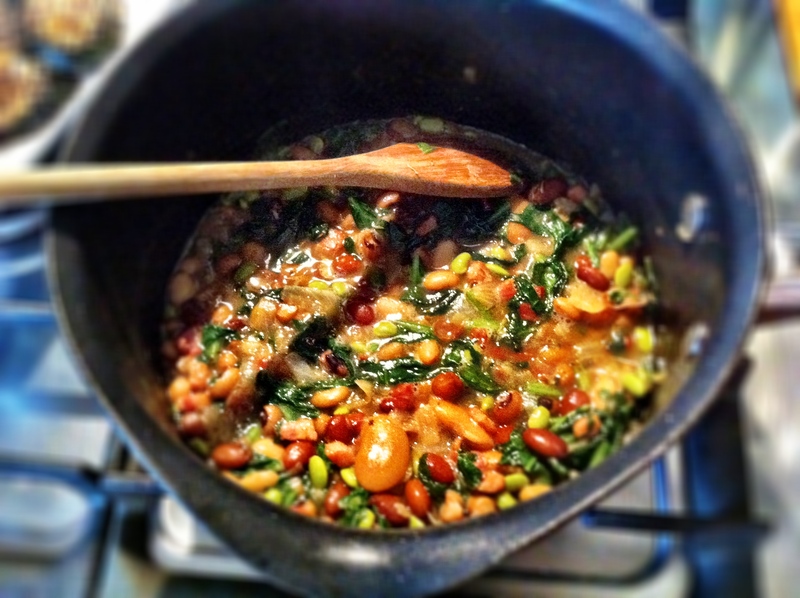 Bean stews can lack a bit of texture so my idea was to add some fresh edamame beans and spinach to the stew – the edamame beans retain a bit of crunch and the spinach just helps to lift this into a summery rather than wintry dish. This was so nice that the grilled pork chop could easily be surplus to requirement. 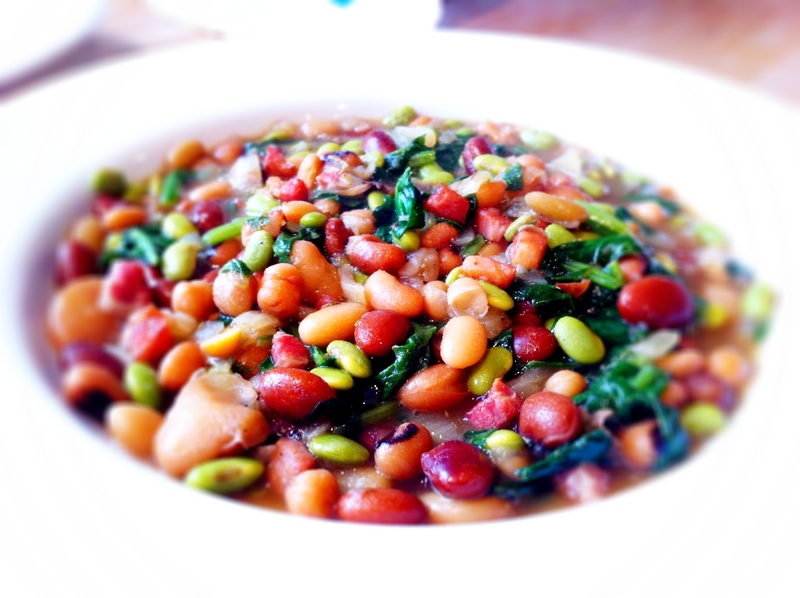 A really simple casserole-style bean stew cooked in cider which you can knock up in minutes. The edamame provides a lovely contrasting but gentle crunch for extra texture. A mix of summer and winter in one. 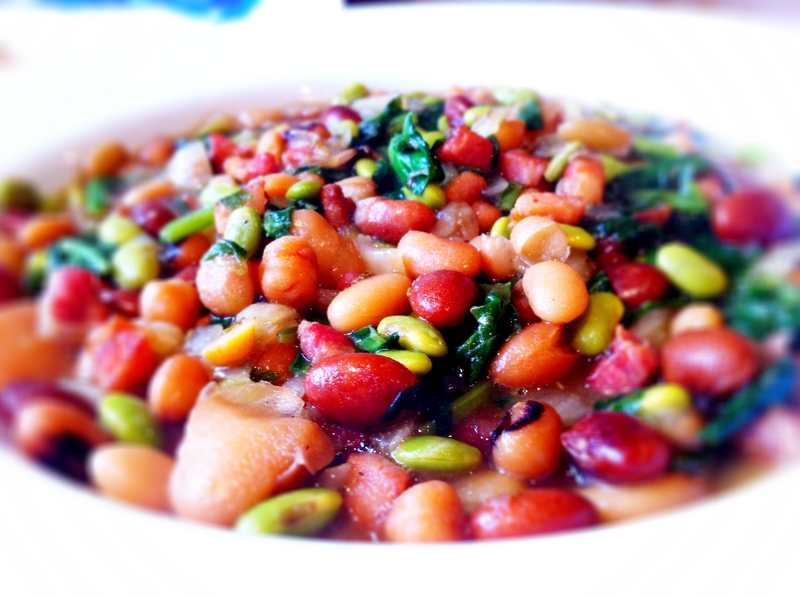 As always, because of the differing taste we have in food, I used my husband as my guide and critic; when I first told him I was making this bean dish, I could tell he was a bit sceptical though had the good grace not to say anything. He was not only worried about the potential consequences of eating so many beans but I could also tell the lack of potatoes or other starchy carb weighed on his mind. However, both of us needn’t have worried. Nowadays, it takes quite a lot for him to give me a ‘two thumbs up’ but two thumbs he did indeed bestow. He liked this dish so much he actually even tried to recreate it himself while I was away on business this week. As he didn’t actually have my recipe to hand, he made his own version but didn’t take any pictures to show you. However, the fact that he chose to cook a bean dish to replace his normal carb intake was proof enough that we can find stodge-free recipes that remain equally satisfying and tasty. Go for boneless pork chops to reduce cooking time but do allow at least 3 hours for marinating. The real star of today’s dish. My husband’s just told me you’re right! I haven’t been around so haven’t heard the news. That’s at least one piece of good news while we try to get through this dismal weather… 🙂 can’t wait to see what you’re going to make, you know I love pork! Ours hosepipe ban is still enforced here in W.Sussex. Can’t believe that most of the country is knee-deep in water, and yet we have to keep our hose in the shed. Not that we need a hosepipe right now – everything is quite well watered, thanks to all the rain. That looks so hearty and delicious! And I’m sure there many levels of flavor, with the pancetta, cider, et al. Well done! What a delicious dish! I’ve been following Euro 2012 over here in Chicago religiously! This looks like a great meal for your unpredictable weather. We didn’t have a summer in Sydney this year either. It was cold and wet most days and we didn’t eat outside at night at all as it was just not warm enough. My sister is in London at the moment and she is not enjoying the weather one bit. Can’t believe how wet and cold it is. Fortunately, you have some lovely cooking to cheer you up! Where do I begin?! 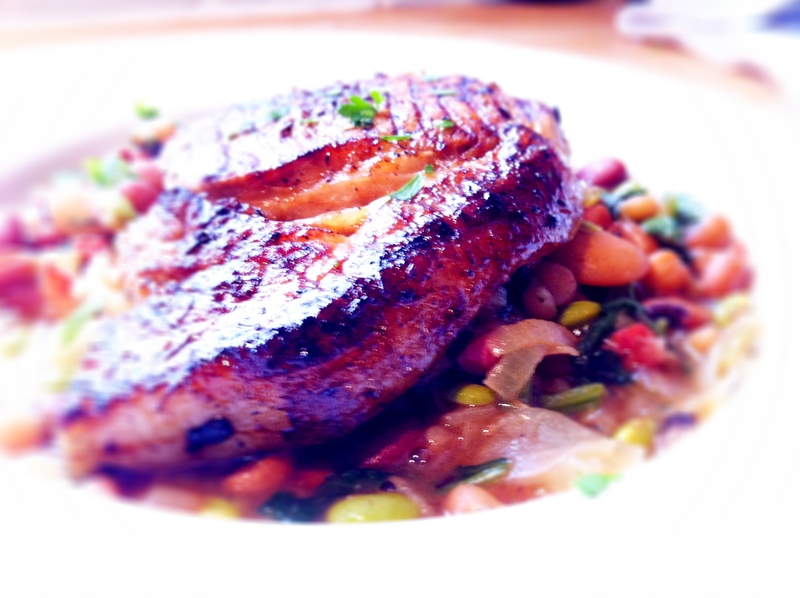 The pork chop is grilled to perfection…just a bit blackened and glazed so nicely in your magic marinade. 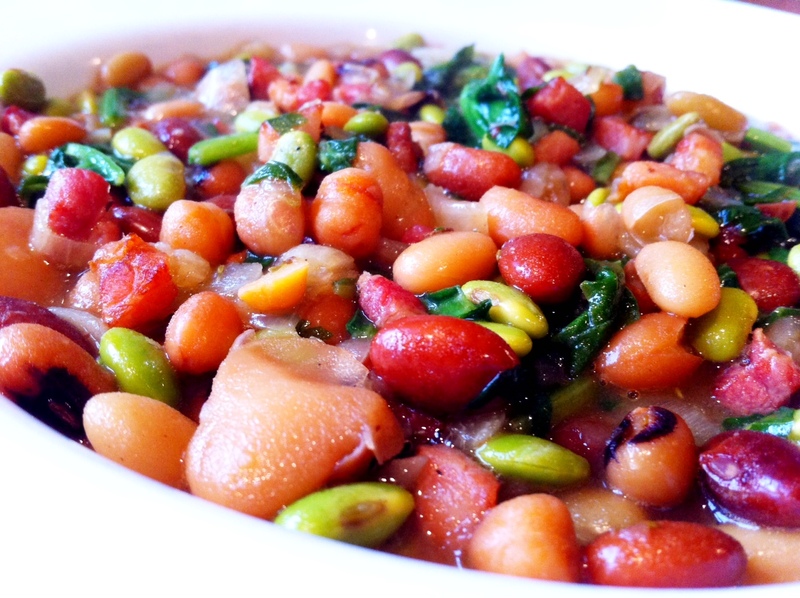 And that bean dish looks and sounds so packed full of flavor and texture. No wonder this meal got two thumbs up! I feel so bad for you with the weather, but at least you can leave the UK on your business trips once in while. Our summer is wonderful, we had a few days of high humidity but it broke the other day and it’s a lovely 25°C with only 30% humidity (compared to the 90% we’ve had). The dish looks lovely but slightly too heavy for the summer months. I love the waitrose packaging! I am sorry to hear about the weather but really I think a lot of the world is experiencing some really nasty spouts this year. What is up with mother nature? I love your picture of the stadium where it is focused in the center and fades in the outside-very nice. Also this dish looks especially scrumptious, as do all your dishes, but this one has really caught my eye and is book marked.